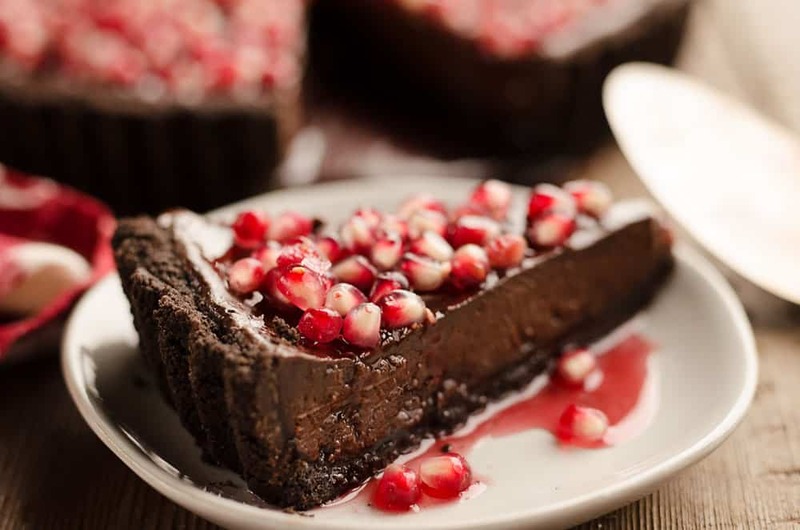 Salted Dark Chocolate Pomegranate Tart is a rich and decadent dessert perfect for a holiday party! 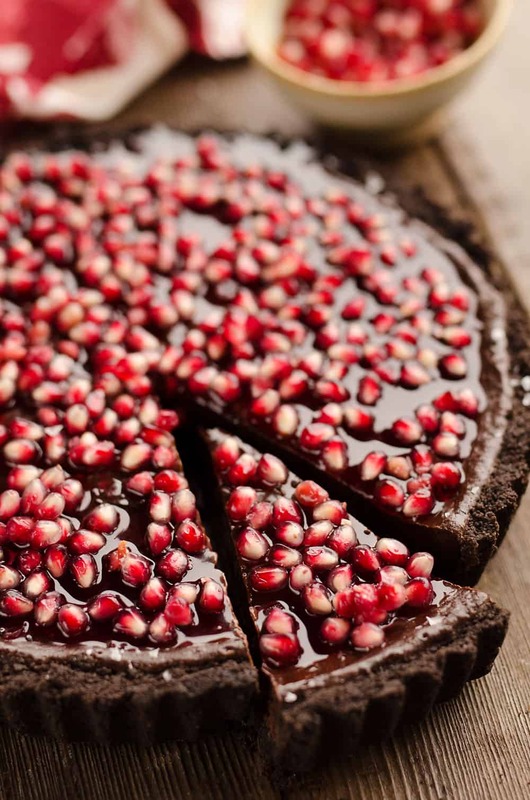 A chocolate crust is filled with a salted ganache and topped with pomegranates seeds and a sweet fruit glaze for an impressive treat. 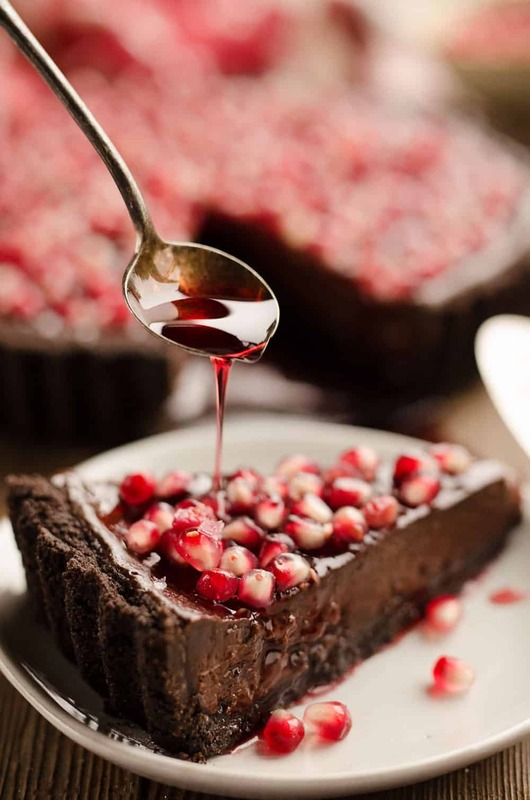 If you are looking for a decadent dessert to serve your guests during the holidays, this Salted Dark Chocolate Pomegranate Tart is where it’s at! 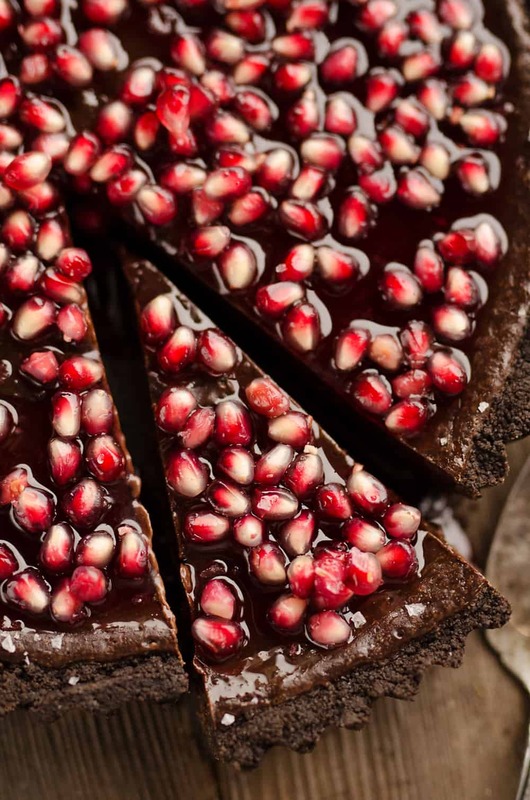 A crust made of Oreos and butter is filled with a rich chocolate ganache and topped with fresh pomegranate seeds and a pomegranate glaze. It looks like an overwhelming dish to make because of it’s impressive appearance, but it is actually a very simple dessert recipe! 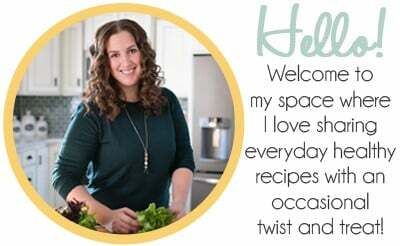 I have made this for multiple gatherings and it has been a hit overall. As one person put it, it’s like eating a slice of truffle! 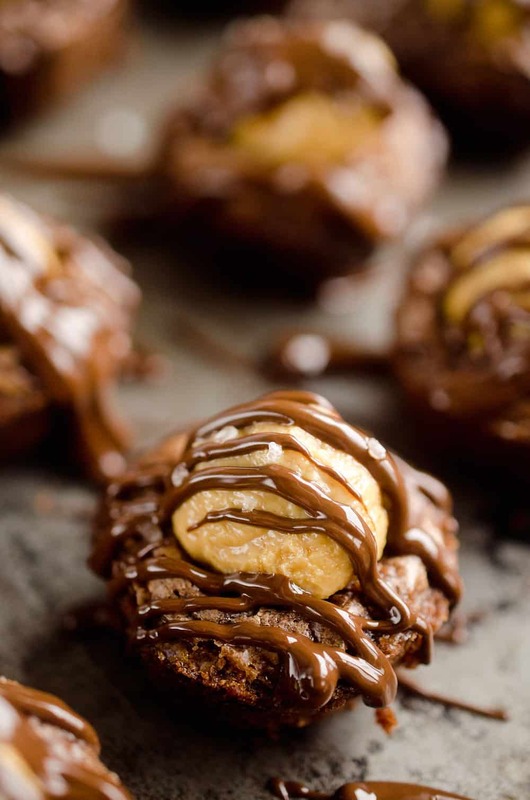 This dessert is not for the faint of heart and is definitely for the chocolate lover. Some of my family who aren’t big chocolate lovers said it was a bit too much for them. 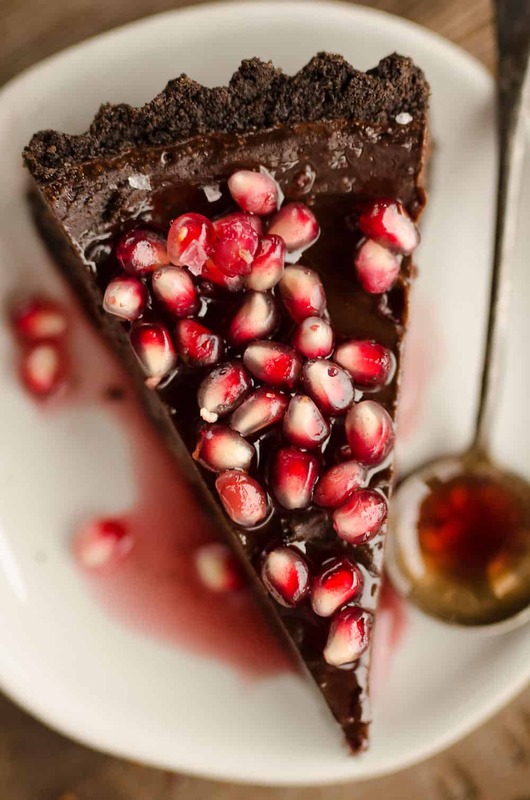 Others who are big chocolate fans were in love with the Salted Dark Chocolate Pomegranate Tart! This is a large tart and servings should be small based on how rich it is, so it will go a long ways. If you aren’t a big sweet and salty fan, you can easily leave out the sea salt in this recipe. I personally love how salt brings out the flavors of chocolate so I am all about it. You can also customize it with different fruits on top. I didn’t have any pomegranate seeds on hand the last time I was making it, so I topped it with some fresh blueberries. The chocolate is really the star of the show here! 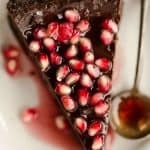 The better the chocolate you use, the better this Salted Dark Chocolate Pomegranate Tart will turn out. This is not the recipe to use a cheap grainy chocolate on. It doesn’t have to be the super expensive European chocolate, but make sure it’s a good quality that you like. It will add to the smoothness and richness of the overall recipe. Enjoy this dessert at room temperature for a rich and creamy treat or scoop out a piece right from the refrigerator for a firm chocolate tart. 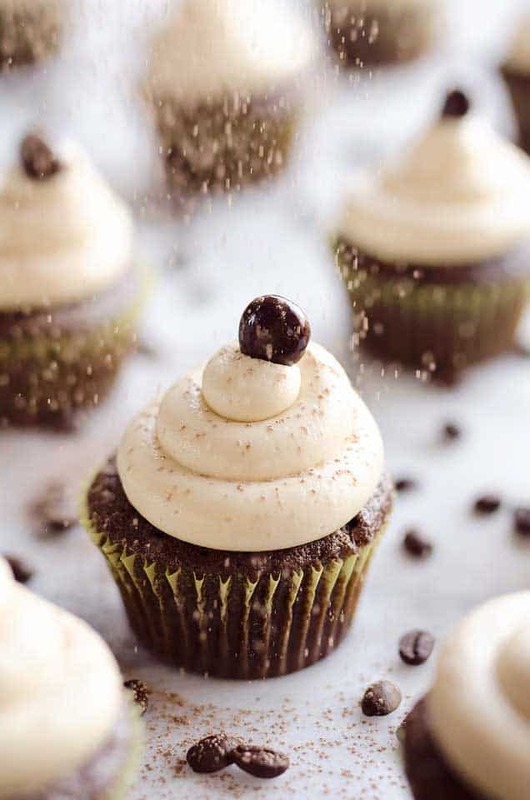 No matter how you serve it, I guarantee all the chocolate lovers will rejoice! Add the Oreos and melted butter to your food processor. Pulse until it is smooth and just comes together. Press the mixture into a round 10 inch tart pan with a removable bottom. In a small bowl, microwave the cream for 2 minutes. Pour the cream over the chocolate chips and stir until the chocolate is all melted. Add the vanilla, sea salt and beaten eggs to the mixture and whisk until smooth. Meanwhile, in a small saucepan, combine the sugar and pomegranate juice. Cook over medium high heat stirring constantly. Bring to a boil and cook for 2 minutes. Remove the juice from the heat and pour in a jar. Store refrigerated until serving. Allow the tart to cool to room temperature. 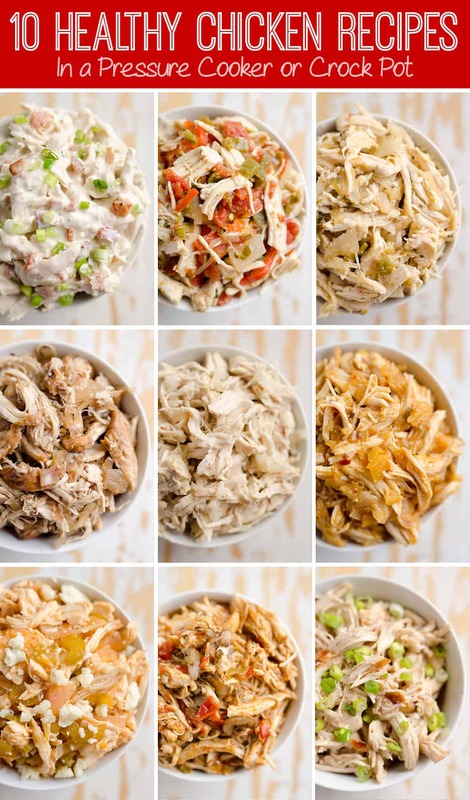 Serve at room temperature or refrigerate until ready to serve at a later time. Serve topped with the pomegranate seeds and glaze. OPTIONAL: Garnish with flaky sea salt. This is BEAUTIFUL!!! I love the idea of the Oreo crust!!! I am making this for the holidays!! Mmmm… Pomegranates! O wow, this looks BEYOND divine! And I am in the “you can never have too much chocolate” camp. I’d take a slice any day! Absolutely stunning!!! Chocolate is my favorite and I would love a slice of this! This tart is absolute PERFECTION! As a major chocolate lover, I have a feeling I’ll love this. I also love the addition of pomegranate to it–such a delightful tart/sweet pop to pair with the chocolate! Sorry, but I did not care for this dessert. I like most of your recipes, but there is zero sugar or any kind of sweetener in the chocolate pie. I know the oreos and the pomegranate sauce are sweetened but it is not enough for me. And pomegranates are just like eating seeds, hardly any flesh. Will have to try some of your other desserts.